I am sitting in our trusted tire place, working. Which is fantastic because I have a lot of work to do today. It’s pretty amazing to think about everything we can do thanks to technology. Even as I sit in front of a TV as old as me, I am zipping through my to-do list: blogging, editing, writing as well as I would at my “real” work desk. I am wirelessly making my day happen, squeezing every moment of productivity out of my wait. Makes me think today’s desk is more mindset than a cherry perch. You can do things when you need to, where you need to. Which is great for a freelance writer like me. As the green grass grows. When my husband and I got our house seven years ago, I was very pregnant with our first born and our minds were elsewhere. After a few years, the front yard started to show the neglect. A once-green lawn slowly gave way to weeds and crabgrass; the Earth below became brittle and compressed. And that’s when the ants moved in. At one point, we pretty much threw our hands up and mowed the weeds (and dirt) and called it a day. And that’s how things went for a few years. These days, though, I have two wild young boys who love dirt and wide open spaces. I need the front yard to keep my house from becoming a barn. Last year, we found a roadmap for getting the grass growing again in Family Handyman magazine. I was initially drawn in by the headline: Whip Your Sorry Grass Into Shape. But after we both read the article and choked on an estimate for sodding the front yard, we thought we should give it a shot. What did we have to lose? I’d venture to say we completed half of the recommended measures, got our centipede grass analyzed by Clemson Extension Center and kept it watered for the most part last year. We did see some improvement, too. This year, we are following the plan again and the changes are pretty dramatic already. Hopefully, we’ll make it through the entire plan, and on Mr. Lawn’s schedule. We’re almost halfway there. As I was puttering in the yard this morning, I was thinking about where the effort lies in getting grass growing again. It’s not the grass itself; it’s the soil. Grass doesn’t grow well in arid, compacted ground. Beyond a cactus or yucca, what does? With nourishment and attention, crunchy ground gives way to soil that’s soft, rich and more nurturing. Then, nature lends a hand. 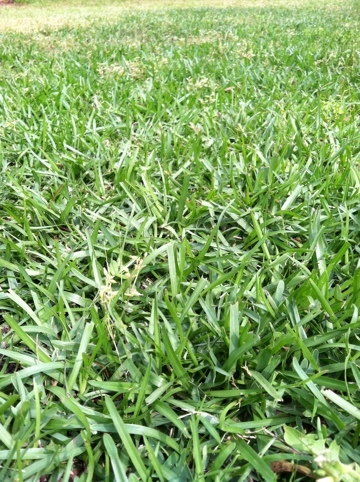 With stronger roots, grass will flourish, retake ant hills and choke back weeds. Watching our yard fight its way back to life has been an amazing lesson. You’d think the grass we had wouldn’t stand a chance at being healthy again. But rather than scrape it off and start over, we put efforts toward strengthening the foundation we had. And those efforts are paying off. This could be the year I have to ask the great Google how to get those pesky grass stains out of my kids clothes. A blog post here. A blog post there. I enjoyed blogging for the past few years for The Adams Group. It was a lesson in so many things. Social media as it relates to hospitals, a modern house and the lift you get when a cycling demi-God gives your blog post a retweet. One of the most personal posts was one about a community uniting to search for a sweet lost dog named Elsa. One of the biggest highlights was being a guest-blogger for Brains on Fire’s Lesson Eleven post series. You can read that post here or red their whole series for an extra dose of inspiration. Observations. Celebrations. Conversations. Nike nation. I even wrote about writing and writing exercises that can help non-writers. I’m the first to admit that blogging’s not for everyone or every company. For me, it’s been a great way to not only write more, but to learn more, too.